Right now I'm hiding out in my house after squealing like a fan-girl while watching this film. Gotta say, Andrew Garfield did a better job than Toby Meguire, much more lively. Spidey was actually cracking wise in this one. The question is was it good though? I haven't heard much hype about this one, strange considering how strong the previous films were at the box office. Less strange considering how terrible Spiderman 3 was. I still hold out hope being a Spidey die-hard and a Garfield fan, but the fact I haven't heard much, good or bad, usually means its not going to go well. Decent, but not great. Other than a few scenes, the 3-D was uninspired and unnecessary. I thought the casting was good. But how can you have a Spider-Man movie without J. Jonah Jameson and the other Daily Bugle characters? Nooooo! J.Jonah? Bah! He never provided any entertainment value. Nope. No Robbie Robertson, Ned Leeds, or Betty Brant, either. Not to mention the lack of Harry Osborne and Mary Jane Watson. I guess they didn't want to overload this one and decided to save up a few characters for the sequel. I caught it this weekend, the first weekend of its screening in Australia. The turnout was not big, but I usually go to a small independent cinema rather than a multiplex. To me, it was a solid movie but not over-the-top awesome. Having seen the many Spider-Man movies over the decades, and read a fair number of comics, I have witnessed the evolution of the character and story lines, and this one seemed like a good retelling of the story. I can see why they left out J. Jonah Jamieson and everybody else, as this concentrated on his early life. The action scenes were superb but throughout I would suddenly remember that they were being done with CGI, and I found myself trying to discern what was CG and what was not. After a while I just gave up and enjoyed it. Emma Stone portrays a really sweet and no-nonsense kind of girl, and Andrew Garfield's Peter Parker was very well played. I liked how they used a lot of Spidey-mannerisms like the wise-cracks, and webbing up people's faces, eyes, mouths and hands just like in the comics. I'm told that the 3D version is even more visually cool, but we only saw it in 2D. Something that kind of spoiled the movie for me was knowing what major plot things were going to occur, and you can see it coming from miles away. Yes, he's going to be bitten by a spider. Yes, Uncle Ben is going to die. Yes, he is going to invent web. Somehow he gets inspired to put on a mask. I think the problem with remakes and reboots of classic stories is that you know where it is going to go, and you're just waiting for them to get it over with so you can see what they do with it. Had I never read a Spider-Man comic or seen any of the movies I would have enjoyed it a lot more, I think. This was not a movie made by artists. This was a movie made by business men. This was the movie Colombia pictures had to make or lose the rights to the franchise. This what the first couple of seasons of Smallvilie would have been like if it followed Spider-man instead of Superman. As you can probably tell, I was disappointed with this movie. For starters, even if they wanted a reboot-they should have done what the Incredible Hulk movie did and at least assume its audience knew the deal about Spider-man. They could have hinted at the origin while still establishing that this was a new series. Secondly, I though a lot of the dialogue was pretty bad. I liked that Spider man was cracking jokes, but most of the non-superhero moments where something out of a bad CW show. Thirdly, I really didn't care about most of the characters. 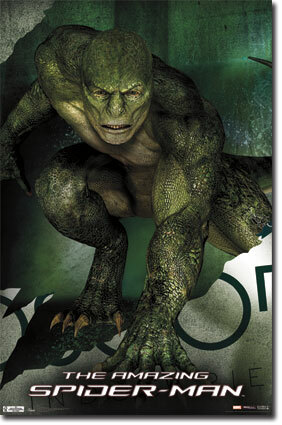 As for the Lizard...While I consider myself just a casual fan of the Spider-man series, the Lizard is one of my favorite Marvel villains. So I know in his earlier appearances he was really more of a man with reptilian features, but as my one friend Mike put it-he looks like a Goomba from the Super Mario brothers movie. And his plan would have been a lot better if we had seen it more as a real threat. He infects only a handful of people that we don't see again when their cured. It didn't seem really justified for the measures they took to stop it. So yeah...wasn't too happy coming out of the theater that night. Off to see it now. But I'm opting for 2D as it's cheaper, and it's the early show. Didn't feel like waiting til 10:30 tonight for the 3D. By the trailers it looks like it's attempting to be a ripoff of Nolan's Bat-series, all angsty and dark. But I assume I'll find out. I really, really dug this. I have plans to see it tomorrow with my girl and some friends. Looking forward to it! So...the post-credits scene. Any guesses who it is? Granted, if one is somewhat familiar with the comics, there's a pretty good chance one would know who it was. But, that leads to Gwen and all.